Paint might be literally superficial, but a good paint job or a bad one makes a huge difference in the look, and feel of a building, office space, or home. While many people paint their own interiors, most have to hire a professional if they want a professional-quality job. And hiring a professional is usually a must for painting exteriors. 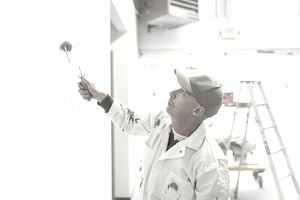 You do not need a degree, nor do you need to complete a specialized training program to paint, but in most states, you do need a license and you must know how to paint properly in order to receive your license. You will also need to get insurance to protect you from liability should anything go wrong. Painting interiors and exteriors are, in many ways, two separate jobs, since the paint types and the required tools are different for each. You can choose to do one or both. As a painter, you will either work for a contractor or you will work independently. If you choose to apply for a job with a contractor, you can use the skill lists below to help assemble keywords for your resume and cover letter and to prepare for your interview. You should always read job descriptions carefully, as requirements can vary between apparently similar positions. As an independent, self-employed painter, you will be searching for clients, not employers, and will seldom need a resume. However, you can still use the list to help determine whether a career in painting is right for you. Take a look at some of the top skills you should master as a painter. If you are interviewing for a job, make sure you can address these topics. There is a strong likelihood that one or all of these topics will be discussed. And, if you a looking for a career path, do a self-check to see if these skills are or can be among your strengths. To serve a client’s needs, you must understand what the client wants. Unfortunately, many people do not know how to explain what they want clearly, so you will have to be able to either draw out more exact instructions or use your judgment to fill in the details. Remember that good communication means hearing and respecting what the client wants, not what you think they should want. You can make suggestions, but the owner of the property always has the final say. Most clients will need you to make at least some judgment calls in your work, and some will directly ask you for advice. You need a strong sense of what looks good. Think of the job site as a work of art. What makes a good, or even a great paint job is in the details, such as crisp, clean edges, even coats, and well-adhered layers. A small error can subtly but meaningfully alter the look of the room or building. Painters use a variety of brushes, rollers, scrapers, wire brushes, sanders, and texturing tools in order to create different effects, and you must know which ones to use for each circumstance. You must also know how to use each efficiently and well. Tool choices differ between interior and exterior painting, and different tools might also be required for painting in different styles or textures. Special treatments and cleanup also require their own equipment and materials. Paints vary not just by color, but also by texture, luster, viscosity, drying time, and other factors. Then there are primers, varnishes, sealers, and finishes, which also vary widely. Choose the wrong combination on the wrong surface, and the paint could peel, crack, wash away, or look bad. Painters need good manual dexterity in order to achieve a good, clean coat. But you also need the strength and ergonomic skills to move equipment safely and efficiently, and a strong sense of balance in order not to fall off roofs and ladders. Whether you are self-employed or an employee, you will likely spend most of your workday alone, or at least out of view of your supervisor. You must be able to work efficiently and well without direct oversight. Self-employed painters must also be able to give accurate estimates of how long a job will take to complete. Review the general skills employers seek in the candidates they hire for painter jobs. Skills will vary based on the position for which you're applying, so also review our list of skills listed by job and type of skill. Also, if you are thinking of a career switch, think about all of the skills you have under your belt. Several of these skills are transferable to other fields. Capitalize on your greatest assets when looking for a new line of work.